audiovisual services and event planning. plus Capriccio Grill and Peabody Deli & Desserts. Another of the hotel’s many merits: a location in Memphis’ business district, minutes away from such attractions as the Rock ’n’ Soul Museum, Elvis Presley’s Graceland, and Beale Street, with its renowned blues clubs and barbecue emporiums. Onsite, guests savor several fine restaurants, chic boutiques, a fitness center, an indoor pool and hot tub, and a full-service spa. A business center and FedEx Office in the lobby — the first location established for the Memphis-based company — stand by to assist with business and shipping needs. Planners have access to more than 80,000 square feet of event space on two levels. The Mezzanine and Grand Ballroom level is designed for larger groups and allows for smooth transitions between meeting rooms and smaller breakout areas. Two junior ballrooms and the Peabody Executive Conference Center feature the same telecommunications technology and audiovisual services while catering to medium and small gatherings. In addition to high-level production values and business support, the hotel provides a full spectrum of banquet and catering services. Best conference we've ever had! The staff are superb and the hotel is beautiful. WOW! If I could give the staff 100 stars I would. My group had it's own challenges and lots of changes. The staff, especially Ken Nelson, took it all in stride with the best attitude and always a smile on their face. We had terrible weather but as if the Event Gods smiled upon us the one night we were on the roof the weather cleared. The hotel was prepared for every contingency. Awesome experience! I would like to take a minute to talk about Brandon Benson - he was my hotel contact and this was a very difficult pod, full of changes and additions and out-of-the-norm needs. Brandon handled every email and phone call (even off-hours) in stride and never once made me feel that I was being a bother. This was hands-down the best experience I've ever had with a hotel contact. I called Brandon's boss to rave about him and I highly suggest you recommend him as well. There is nothing he can't do. Let me say that our experience at the hotel was A-MA-ZING. Our venue last year set the bar very high and we tried to be realistic with our expectations in regard to what kind of service we would receive at The Peabody. They are to be commended for having such a sound team. I just can’t say enough good things about the experience. A beautiful hotel which still holds all the charm of the old South. The staff is friendly and cannot do enough for you. A great location for attendees who love night life. Beal Street is a great place to wander around and is only a few short blocks from the hotel. The Peabody is a wonderful hotel for corporate meetings - they are VERY attuned to the meeting planner's needs, and are eager to assist in any way. A very pleasant meeting experience. I brought a small group here for a training program. The conference services were a little lacking - i got pushback a couple of times for thinking outside of the box. Overall I love the feel of this property and it's proximity to downtown. This hotel is lovely and everyone enjoyed the history. Very accommodating and would use again. We had a great meeting and everyone loved the hotel. The staff is obviously well trained. They were always smiling and asking us if they could be of assistance. It was very refreshing. MEMPHIS, TN - December 12, 2008 - The best room at The Peabody Memphis hotel isn't the one with 1,000 thread count sheets, a giant flat-screen television, and 24-hour room service. Instead, it's the suite on the rooftop with a granite sun deck, a swimming pool adorned with a bronze sculpture of splashing ducks, sweeping views of the Mississippi River, and the dedicated services of a Duck Master. 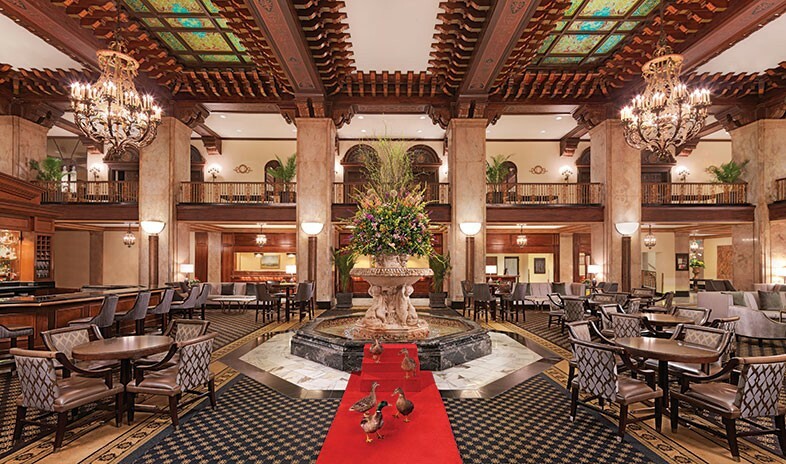 This, the sweetest of suites, is the new home of the historic hotel's resident marching mallards, The Peabody Ducks. Capping off the 75th anniversary year of The Peabody Ducks, the "South's Grand Hotel" unveiled a luxurious, new Duck Palace for its famous flock during a House Warming Party held in their honor. The 288-square-foot Duck Palace is made of brick and granite with a 24-foot glass viewing panel and a sloped metal roof. Inside is a swimming fountain with a bronze duck water feature, an elevated sun deck, and a replica of The Peabody Hotel for the ducks to sleep inside. The Duck Palace also is equipped with ceiling fans, overhead lighting, and ventilation and drainage systems. Construction on the new Duck Palace began in September and took 3 months. The project cost approximately $200,000. The new Duck Palace replaces the previous structure, which opened in 1985 and had a Camelot theme. After 23 years, however, the decorative mural of a castle on a hilltop had become sun-bleached and the structure was beginning to show its age. At 24-feet-wide and 12-feet-deep, the ducks' new home is significantly larger and more luxurious than the previous structure. The 5 North American mallards spend their days at The Peabody working the room from the hotel's magnificent lobby fountain, but when 5 o'clock rolls around the ducks clock out and ride the elevator up to the rooftop to retire for the evening. The Duck Palace is open to the public from 8 a.m. to 10 p.m. daily. The Peabody Ducks are one of the top three attractions in Memphis (along with Graceland and Beale Street). People come from all over the world just to see the ducks. The hotel's web-footed ambassadors are also national celebrities having appeared on The Tonight Show with Johnny Carson, Sesame Street, The Oprah Winfrey Show, in People magazine and the Sports Illustrated Swimsuit Issue. Memphis, TN - Global Event Partners (GEP), the leading partnership of destination management companies (DMCs) worldwide, has named Memphis the host city for the 2009 GEP Executive Summit. The annual convention of destination management executives and meetings industry professionals is scheduled for June 25 - 28, 2009, at The Peabody Memphis. The announcement was made today in front of over 250 delegates at the conclusion of the 2008 Executive Summit in Paris, France. The 2009 GEP Executive Summit will bring approximately 65 destination management companies to Memphis to discuss issues impacting the DMC and meeting planning industry in a series of intensive workshops, educational seminars, and networking opportunities. This invitation-only event allows each partner to invite two-to-three of their top clients, mostly corporate and incentive meeting executive planners with the potential to bring future meetings and business to Memphis. Previous corporate clients to attend the Summit have included Coca-Cola, Deloitte, Buffalo Wild Wings, and American Express. The selection of Memphis as the 2009 Executive Summit location is a result of an aggressive effort on behalf of Destination King, the Memphis Convention & Visitors Bureau, and The Peabody Memphis. The local commitment to host the event exceeds $750,000, which is being paid in part by local sponsorships from the Memphis CVB, The Peabody Memphis, Destination King, and their partners. needs to be on everyone's top ten list," said Chris White, Chairman and CEO of Global Events Partners. Global Event Partners includes more than 65 leading destination management companies from around the world. Each of GEP's partner DMCs - such as Destination King in Memphis - is an independently owned and operated business that sets the standard of excellence for event management in its destination. DMCs possess extensive local knowledge and resources, and specialize in the design and execution of group tours, transportation, events, activities and program logistics. The GEP Executive Summit is an annual, invitation-only meeting that has been held in some of the world's most amazing destinations, including Madrid in 2004, New Orleans in 2005, Salzburg, Austria in 2006, and The Bahamas in 2007. This year's Executive Summit is being held this week at The Westin Paris in Paris, France, July 9 - 12, 2008. MEMPHIS, TN - January 28, 2008 - The Peabody Memphis has joined the exclusive list of Four-Star hotels, as ranked by the Mobil Travel Guide. The historic hotel's signature restaurant, Chez Philippe, also retained its Mobil Four-Star status for the 20th consecutive year. This is one of the hotel industry's most coveted ratings, a claim supported by the fact that out of 70,000 hotels in North America, only 125 earned the Four-Star rating in the 2008 Mobil Travel Guide. The Peabody Memphis is one of only two Four-Star hotels in Tennessee, and likewise, Chez Philippe is one of only two Four-Star restaurants in the state. There are no other Mobil Four-Star hotels or restaurants in Memphis or the Mid-South. The Mobil Travel Guide is the gold standard in travel ratings and reviews. "Most travelers may be familiar with the concept of (Mobil) star ratings, but many are surprised when they discover just how few properties actually receive the Mobil Four-Star rating," said Shane O'Flaherty, President & CEO for Mobil Travel Guide. "We're always thrilled when we receive an industry award, but achieving Mobil Four-Star status is truly special to me and to our 550 associates. We have been working toward this goal for several years now, and today I can tell you that there is a palpable excitement and feeling of accomplishment within the walls of The Peabody," said Doug Browne, General Manager, The Peabody Memphis. "The commitment to excellence and the tireless effort of both the management team and staff from The Peabody Memphis on day to day basis is remarkable. These distinctions reflect their dedication to consistently improving upon the guest experience that we recognize and honor today," added O'Flaherty. The Peabody Memphis was among the Mobil Travel Guide's Four-Star hotels once before, but lost its fourth star in 2001. "Regaining our fourth Mobil star took a huge commitment from everyone involved, including our owners," continued Browne. Belz Enterprises and the Peabody Hotel Group invested in a top-to-bottom, multi-million dollar, four-year renovation of the hotel. But the transformation reached far beyond the hotel's physical property, it extended to its people. New leadership was brought in, hotel standards were reviewed and associates were recertified in Peabody Service Excellence. Even associate uniforms were upgraded to achieve a more elegant look. The commitment to excellence by The Peabody's ownership is reflected in their other hotels as well. The Peabody Orlando received its 19th consecutive Mobil Four-Star rating this year. Since 1958 the Mobil Travel Guide's ratings process has been based on more than 750 standardized criteria for hotels and more than 250 for restaurants, making it the most rigorous and comprehensive in the industry. The process begins with a facility inspection that considers every aspect of the property, including its overall cleanliness, condition and location. To achieve Mobil Four-Star status, properties must then meet or exceed Mobil's bar-setting service standards, which are determined through an unannounced, undercover service evaluation conducted by Mobil Travel Guide's expert inspectors. The service evaluation focuses on a myriad of details that combine to create the overall guest experience, such as whether the inspector was greeted by a valet within 60 seconds upon arriving at a hotel or offered a beverage within 60 seconds after being seated at a restaurant. The Peabody Memphis is a Mobil Four-Star, AAA Four Diamond property of Peabody Hotels within the portfolio of the Peabody Hotel Group, Memphis, Tennessee, and is a member of Preferred Hotels & Resorts Worldwide and Historic Hotels of America. Feb. 26, 2008 - Over the past four years, the Belz family ownership group has poured millions of dollars into renovating The Peabody. They and general manager Doug Browne did nearly the same thing with the hotel's 550 employees -- as testified to by the 26 loose-leaf binders of various thicknesses arranged, with spines up, behind Browne's desk in his basement office. The historic Downtown hotel regained its four-star Mobil Travel Guide rating this month after eight years off the list. It's one of 125 in the country and the only one in Memphis. "I don't think there was any one thing," Browne said about getting the added star. "It was a combination of the renovation, the standards, the consistency, hiring people who believe in what they're doing." Shane O'Flaherty, president and chief executive officer of Mobil Travel Guide, banged the drum for steady performance. "They begin to get consistency across all departments," he said. "Interaction becomes more of a memorable customer experience." It is that customer experience that makes up 75 percent of a hotel's score (facilities are the rest) -- Mobil checks 8,000 of them every year, looking at the facilities and sending and inspector in for a three-day, two-night evaluation. "They've continually raised the bar in the customer experience year-over-year," O'Flaherty said. The 26 loose-leaf binders -- one for each department -- were key to the rating, Browne said. The Peabody hired Freeman Group, a Dallas-based firm that had worked with hotels like Ritz Carlton and The Four Seasons, to come up with what were basically operating manuals for each job at the hotel. "Everything we do in the hotel was put into a standard," Browne said. It gets as detailed as answering phones within three rings, returning valet cleaning items quickly, calling guests by name. Over the past two years, managers retrained every worker according to those booklets at a cost he estimated at several hundred thousand dollars. Plus, every new employee must read "Good to Great" by Jim Collins during the worker's first two weeks on the job. "The mindset is that we're a good hotel. Everyone knows us as a good hotel. But we want to be a great hotel," Browne said. However, because The Peabody is also a business, the question becomes whether the higher rating will translate into added revenue and profits. "It will help increase occupancy and average room rates," said Chuck Pinkowski, hospitality analyst with his own Memphis firm, Pinkowski & Co. Whether that will mean added profits will depend on the capital investment needed to gain and maintain the rating, he said. "We've been raising the rates a little at a time as we've completed renovations and training," Browne said. He said added business will come from putting the hotel in an "elite group" in the eyes of meeting planners. Individuals who pick hotels by reading the Mobil guide may also be drawn to the hotel in larger numbers, said Kelly Earnest, director of public relations. "People pay for reputation, too, and luxury image," she said. Browne said the hotel's added star may also help its signature restaurant, Chez Philippe, which has had four stars from Mobil for 20 years. It may be easier for the restaurant to get the highest Mobil rating -- five stars with the hotel at four rather than three, he said. Some of the image boost from the ratings may spill over into the overall Memphis travel business, Pinkowski said. "This is going to give Memphis the ability to wave the flag, that the city is stepping up in class," he said. "I don't know that it's going to sell another convention, but it's something the city can brag about." To see more of The Commercial Appeal, or to subscribe to the newspaper, go to http://www.commercialappeal.com. Copyright (c) 2008, The Commercial Appeal, Memphis, Tenn.